There are some watches that defy the norm. 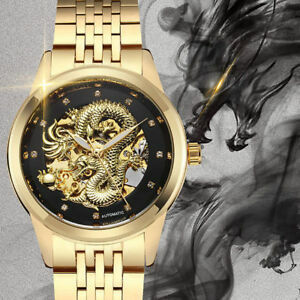 This Dragon Mechanical Watch is one of them! Dragon fans understand the power the dragon symbol hols esoterically. It’s the very nature of Universal Power, as God has power. And with this spiritual understanding can it take effect in our personal lives in strange ways. Symbolically, we all battle dragon in our lives daily. Personal goals to reach that are supremely difficult for certain are your metaphysical dragons to slay. Sometimes they can even take form in smaller forms such as procrastination. Putting off on working out lately? Or how about finishing folding the laundry laying in the corner of your room? These metaphoric task we must complete in our lives symbolize the dragons we all should face with persistance I believe. Represent your achievements with this Dragon Skeleton Mechanical Watch today!